Here is a brief excerpt from an executive summary article written by Vivian Hunt, Dennis Layton, and Sara Prince for a report, Diversity Matters, sponsored by McKinsey & Company. The new research makes it increasingly clear that companies with more diverse workforces perform better financially. To read the complete article, check out other resources, learn more about the firm, obtain subscription information, and register to receive email alerts, please click here. We know intuitively that diversity matters. It’s also increasingly clear that it makes sense in purely business terms. 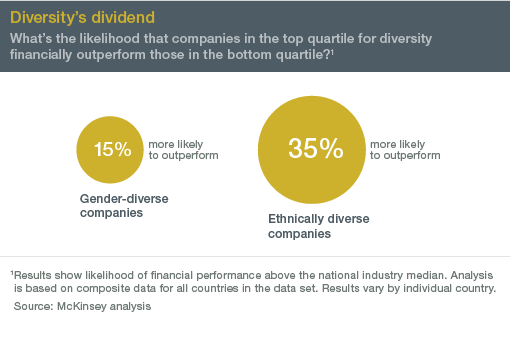 Our latest research finds that companies in the top quartile for gender or racial and ethnic diversity are more likely to have financial returns above their national industry medians. Companies in the bottom quartile in these dimensions are statistically less likely to achieve above-average returns. And diversity is probably a competitive differentiator that shifts market share toward more diverse companies over time. While correlation does not equal causation (greater gender and ethnic diversity in corporate leadership doesn’t automatically translate into more profit), the correlation does indicate that when companies commit themselves to diverse leadership, they are more successful. More diverse companies, we believe, are better able to win top talent and improve their customer orientation, employee satisfaction, and decision making, and all that leads to a virtuous cycle of increasing returns. This in turn suggests that other kinds of diversity—for example, in age, sexual orientation, and experience (such as a global mind-set and cultural fluency)—are also likely to bring some level of competitive advantage for companies that can attract and retain such diverse talent. o Companies in the top quartile for racial and ethnic diversity are 30 percent more likely to have financial returns above their respective national industry medians. o Companies in the top quartile for gender diversity are 15 percent more likely to have financial returns above their respective national industry medians. o Companies in the bottom quartile both for gender and for ethnicity and race are statistically less likely to achieve above-average financial returns than the average companies in the data set (that is, bottom-quartile companies are lagging rather than merely not leading). o In the United States, there is a linear relationship between racial and ethnic diversity and better financial performance: for every 10 percent increase in racial and ethnic diversity on the senior-executive team, earnings before interest and taxes (EBIT) rise 0.8 percent. o Racial and ethnic diversity has a stronger impact on financial performance in the United States than gender diversity, perhaps because earlier efforts to increase women’s representation in the top levels of business have already yielded positive results. o In the United Kingdom, greater gender diversity on the senior-executive team corresponded to the highest performance uplift in our data set: for every 10 percent increase in gender diversity, EBIT rose by 3.5 percent. o While certain industries perform better on gender diversity and other industries on ethnic and racial diversity, no industry or company is in the top quartile on both dimensions. o The unequal performance of companies in the same industry and the same country implies that diversity is a competitive differentiator shifting market share toward more diverse companies. We’re not suggesting that achieving greater diversity is easy. Women—accounting for an average of just 16 percent of the members of executive teams in the United States, 12 percent in the United Kingdom, and 6 percent in Brazil—remain underrepresented at the top of corporations globally. Note: This article is adapted from the report Diversity Matters (PDF–946KB). To register for access to this repoirt and others, please click here. Vivian Hunt is a director in McKinsey’s London office, where Dennis Layton is a principal; Sara Prince is a principal in the Atlanta office. The authors would like to thank Andrea Alexander, Mauricio Arnau, Lori Dobeus, Kirill Dushkin, Lauren Miller, and Katie Smith for their contributions to this report.